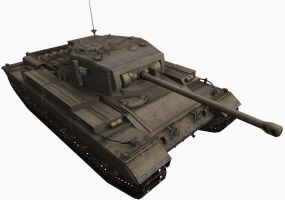 The Caernarvon is a British tier 8 heavy tank. Development of this infantry support tank started in 1944. The first prototype was ready for trials in 1952. A total of 21 tanks were manufactured but never entered service. Some of the vehicles were later converted into Conqueror heavy tanks. A big change in the British heavy tank line, the Caernarvon marks the beginning of the "Universal Tank" era of the tree. Therefore, its mobility is much better than that of the Black Prince. However the hull armor is not as thick despite being sloped which is something previous tanks lacked. The top gun is an improvement of the one from its predecessor in terms of aim time, accuracy and rate of fire and has an ideal role for hulldown tactics as its large and well-armoured (269.9mm) gun mantlet can eat most shots tier-for-tier with no consequence. This playstyle has been improved with patch 9.20.1 which upgraded the top gun from a twenty pounder to the 32 pounder. 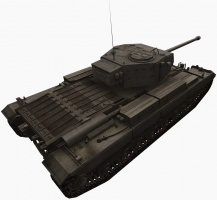 Unfortunately, it takes quite a while to realize this tank's potential if one has not previously unlocked modules on the British Medium tree. This tank has low alpha damage (280) and weak hull armor - therefore it is absolutely crucial to exploit this tank's strengths to the maximum in order to be successful in it, most notably its incredibly high rate of fire combined with tough turret and nice gun depression. When played to its strengths, this tank can indeed be fearsome and after the latest buffs in patch 9.20.1 it is now widely considered to be among the best tier 8 heavy tanks. The Caernarvon leads to the Conqueror. Ammo rack is weak and can be damaged frontally. The Caernarvon is a huge departure from the Black Prince in terms of playstyle; this tank is a FULLY dedicated support unit, and requires a different set of tactics. No longer are you able to act as a battering ram, zig-zagging your way up the front with your forward armor more or less exposed. While this tank might be played successfully with something approaching the same maneuvers as the Black Prince, it is let down by its inferior hull, which is this tank's foremost weakness. It is poorly armored, fragile, and with a large silhouette which attracts plenty of artillery fire. The Caernarvon also sports a terrible traverse speed and lackluster acceleration, often making it a pain to position correctly. 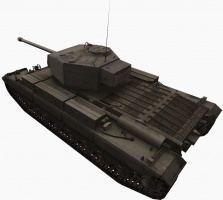 However, experienced players will recognize the strengths of its hard turret and incredibly high rate of fire, combined with good gun handling, nice gun depression and excellent accuracy. In practice, you can shoot 2 or sometimes even 3 times before your enemy reloads (with right modules and crew, it is possible to reduce reload time below 5s!). 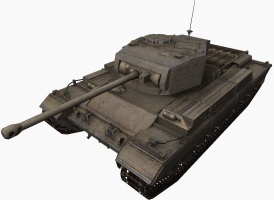 Your DPM is higher than many tier 9 tanks, so put this to use. Keeping enemy tanks permatracked is a viable tactic in this tank. Also, deadeye perk can make a great deal of difference to the fight if you pick your shots. DO NOT trade shots in peek-a-boom tactics, as your alpha simply isn't sufficient for this. Carrying over the support tank philosophy, focused mentality as well as good utilisation of the tanks base strengths when driving the Caernarvon tank with mobility-optimised crew, it is highly effective against multiple targets: the exceptional RoF of the tank allows it to become a thorn in the side of any opponent whom stands in front of an attentive Caernarvon user on any flank with good ridge-lining positions ideally. In a well-utilised ridge-lining position, the Caernarvon's biggest enemy is typically artillery and well-placed shots with high-penetrating guns, as a static target. This tank should be driven with a great deal of care and attention to detail. Use your slightly tall turret seat to peek over hills and the rear of other tanks' hulls, make plentiful use of cover, and always move a step or two behind the main front. Note that if you are careful about exposing your lower plate Wet Ammo Rack is certainly not required, and picking Safe Stowage perk instead is usually enough. Skilled players will find Coated Optics to improve on your excellent view range or vents to maximize your DPM a bigger benefit. Start by researching the upgraded turret. The extra meters of view range, additional 100 hit points and strong armor can make a difference. Researching the OQF 32-pdr next will really boost firepower. NOTE: If you already played through the British medium line, you should have Rolls-Royce Meteor Mk. IVC already unlocked. In that case, it is a viable option to completely skip the last engine (M120) because it will not be needed on Conqueror - you will already have the even more powerful Rolls-Royce Griffon engine unlocked for it, and doing so will shorten the grind to Conqueror by 27000 exp. You can still research it later, either on Caernarvon if you wish to elite/keep it, or the Conqueror to elite it once you have all the other modules. The Caernarvon was a British heavy tank of the post-war era. It's name was based on the namesake of the royal town of Caernarfon, an historical port town in Gwynedd, North Wales. It was developed in a post war period to rival the Soviet IS-3 heavy tank. Compared to the Centurion's 20-pounder gun, the Caernarvon was equipped with a much more powerful 120 mm gun. Its main role was to provide long range anti-tank support for Centurion tanks. They were issued at nine for each regiment in Germany; usually grouped in three tank troops. The Caernarvon's upgraded turret configuration is fictitious. This page was last modified on 3 January 2019, at 10:24. This page has been accessed 344,769 times.